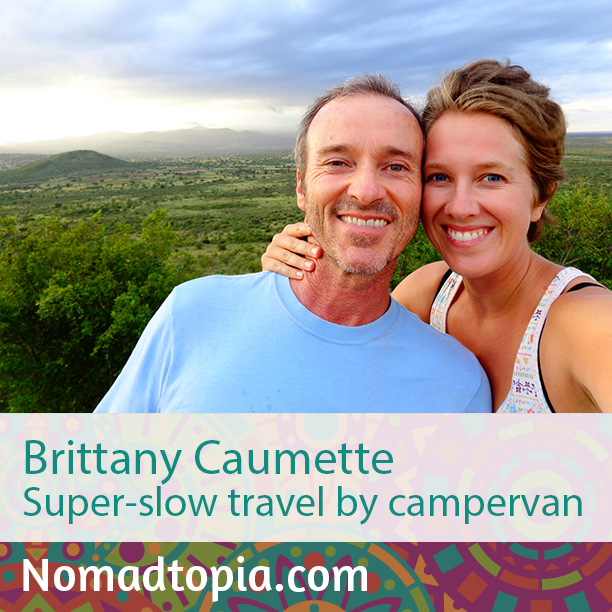 When Brittany met her husband, Bruno, in Mozambique several years ago, they quickly found a way to weave together their different travel backgrounds and experiences to create their own version of Nomadtopia: (very) slow overland travel in a homemade campervan. I caught up with Brittany while they were taking a break in France after extended travels in Africa and the Middle East. Get even more of my conversation with Brittany! Brittany and I talk about getting sick on the road, dealing with health insurance (including what companies we use), how travel makes us humble, and more. Download here for just 99 cents! There are too many amazing experiences to only choose one: creating a library in a rural school in Nepal, motorcycling all around Africa for a year, living on a tobacco farm in Zimbabwe, sleeping in our little campervan in national parks in the middle of nowhere surrounded by wild animals, feeding oranges to wild chimpanzees, petting adult cheetahs and lions, searching for gorillas in the jungle of Central African Republic with pygmies, taking yoga classes all around the world, sailing across the Atlantic, off-roading through the Sahara Desert… the list goes on! But if I had to choose the most memorable experience of all, it would actually be the smallest of all things: waking up each morning and eating breakfast outside with a new and different view, and knowing that I have the whole day in front of me to create with it what I want. How much stuff I can happily live without! Moving into a campervan and having only a few small boxes in which to keep all the things I want to have with me has been surprisingly easy. What’s more, it has been a refreshing exercise in minimalism. Getting rid of a lifetime of clutter has simplified life and helped me find a greater degree of happiness in experiences and interactions rather than stuff. I like to say that I may not have everything I want, but I have everything I need.